Organic Fragrant Cilantro Seeds Perfect for Indoor Growing. Grow four flats of Fragrant Cilantro. 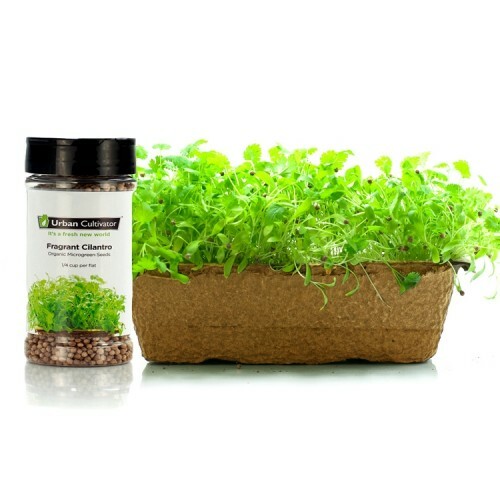 Our seeds are non-GMO, rigorously tested to ensure that they exceed sanitation and contamination standards, and the varieties we offer are carefully and specifically selected for Urban Cultivator appliances. Cilantro is high in: Vitamin A, C, K, beta carotene, folic acid, potassium, calcium, and it tastes: bright, earthy, summery Cilantro is one of the most widely used herbs in the world. Leaves of the plant are frequently referred to as cilantro, while the seeds are most commonly referred to coriander. Cilantro is great in many Asian and Latin dishes.